A few days ago I finally completed my write-up of our 6-day trip to Cape Scott, already a year ago now! Although I’d published the summary post soon after returning home, it took months for us to sift through all the photos and for me to rediscover our notes to help me write up each day on the trip. Looking back on a trip it’s sometimes hard to remember just how it made you feel, and when you do remember, was it just euphoria talking or was it really as good a trip as your words say? I quote my opening line: “Wow! I don’t remember the last time a hike so clearly won me over.” And instantly I’m transported back to those big open beaches, the dense forest, and the sense of wilderness. I think what contributed to how we felt about this trip was the fact that we weren’t expecting to be wowed in the way that spectacular mountain scenes do. The beauty of the place crept up on us and was just there for us to experience. The rest was up to us to be open to that. If you haven’t done any coastal hiking, then I highly recommend Cape Scott. I would also suggest that you wait for a good weather window, though that is tricky given the logistics of getting there. But it’s worth it. Who can resist such idyllic beach camping? Throwback Thursday to this time last year when we were enjoying sun, sea, and sand at Nissen Bight on the second of six days at Cape Scott. I finally got round to finish writing about the trip too – link below. 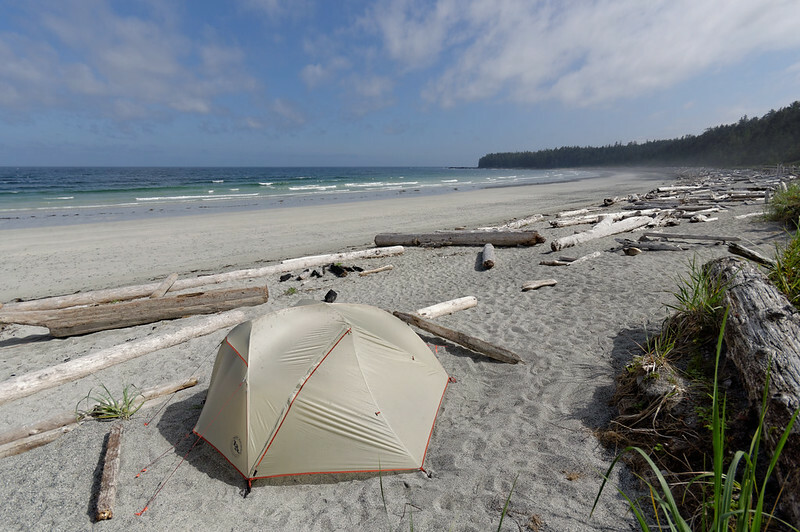 It has taken me ages to finish writing about the Cape Scott trip! Part of that was due to the fact that our note-taking tapered off after the first few days so I had less information to jog my memory when it came to the little things. Also if I didn’t insist on trying to essentially reconstruct each day then I could have written a much shorter series of blog posts and presumably finished a lot sooner. I think it would be a good exercise to try and condense it into something a bit more readable (say for The Outbound) but that would take time away from writing up all the other trips we’ve done that are merely drafts! If you would like to read the whole thing (all six days’ worth), then start with my overview post, and read the entry for each day linked from there. (Each day also provides a link to the next one so either way it’s possible to read the entire diary. I’ve included photos linked to Flickr within each day, but we took way to many to include them all so there are also links to the complete album of over 300 photos (as well as a Top 140) on Flickr. Anyway, about the photo itself. The sun came out, the polarizer went on, and the sea turned a tropical colour. We could almost have believed it ourselves had we not first-hand experience of the temperature of the water. Decidedly not tropical! I find that the sooner I post photos of a hike, the sooner I tend to write a trip report. That’s definitely true of Sunday’s trip on some less well-known hiking trails on the flanks of Hollyburn. A very pleasant way to spend a few hours on a sunny Sunday for sure. I need to find a way to start including a map of my hikes too. Photos are on Flickr, and the full write-up is on Being. Outdoors. I finally uploaded some photos to Flickr from our walk around Minnekhada Regional Park back in March, which inspired me to finish the “story” section of the blog post. A very pleasant couple of hours on a sunny spring day. Check out the full post at Being. Outdoors.